Netflix Price Increase 60 Percent - What happed to Grandfathered Pricing? 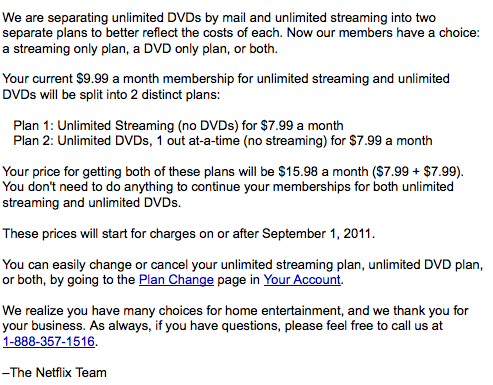 Just when I started to love Netflix, it rewards its loyal customers with a 60 percent price increase. After eliminating competitor Blockbuster, Netflix now has a near monopoly on a DVDs by mail service and they don't even offer as many Recent Movies on DVD that Blockbuster does. 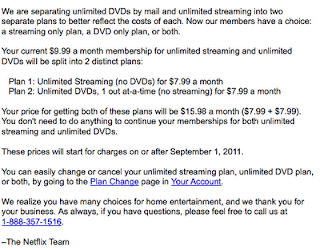 It would have been nice to have grandfathered pricing, but apparently Netflix has never heard of that word. I personally am going to cancel my DVDs by mail subscription and will either see the newer movies in the theater, on the plane or wait for them to be released via Video on Demand (Amazon Video, iTunes, Comcast, U-Verse).